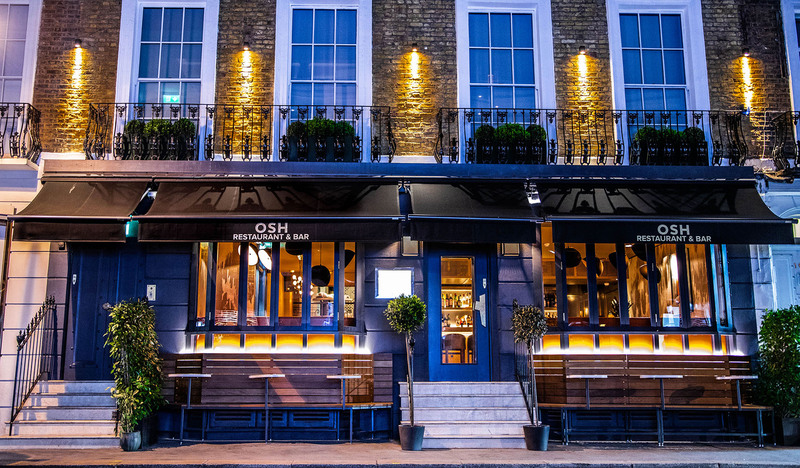 Occupying a mid-terrace three storey townhouse down a quiet side street in London’s most extravagant post code, OSH is a local eatery with a difference. 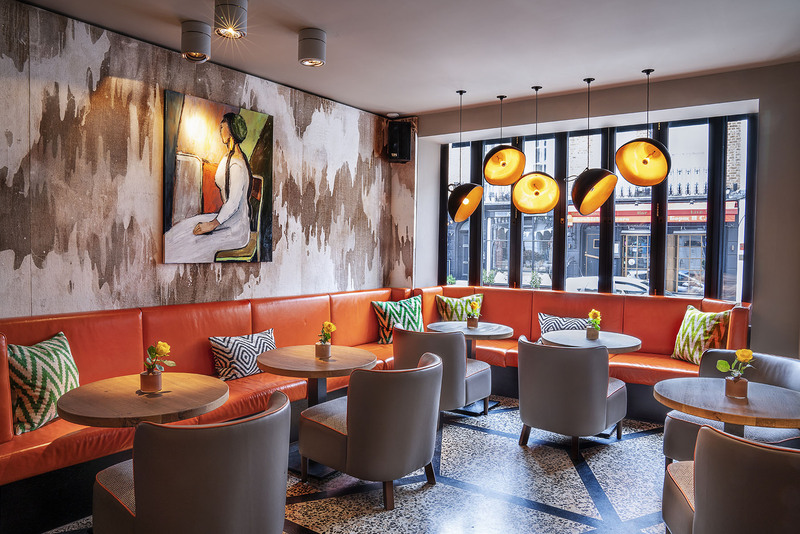 The ground floor bar with its intricately tiled floor, smokey textured walls and saffron leather benches and atmospheric lighting is the perfect spot to unwind. There’s a solid list of classic cocktails, with a few punchy Mexican extras such as Tequila Y Mezcal and Pisco Y Cachaca. 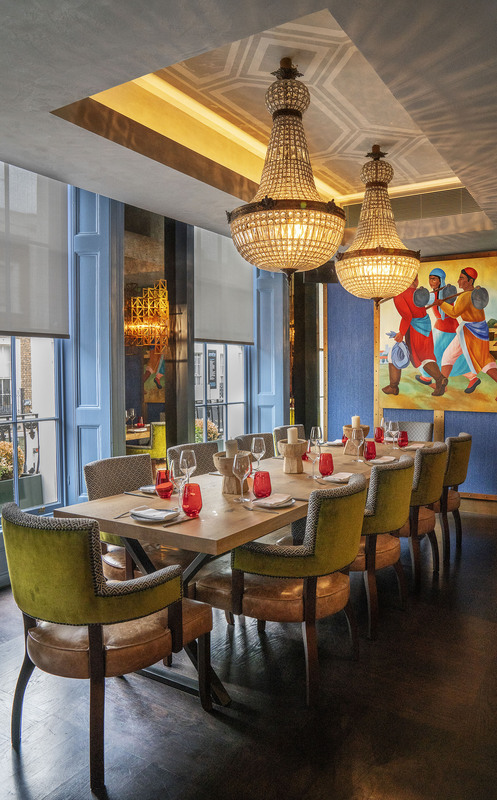 We headed downstairs to the open plan restaurant, where the decor is as vibrant as the Uzbekistan-inspired flavours. The menu offers a huge, bordering on bewildering, variety of sharing style plates, which can be ordered as starter and main if preferred. For the area the food is reasonably priced, although if you’re hungry it can soon add up. 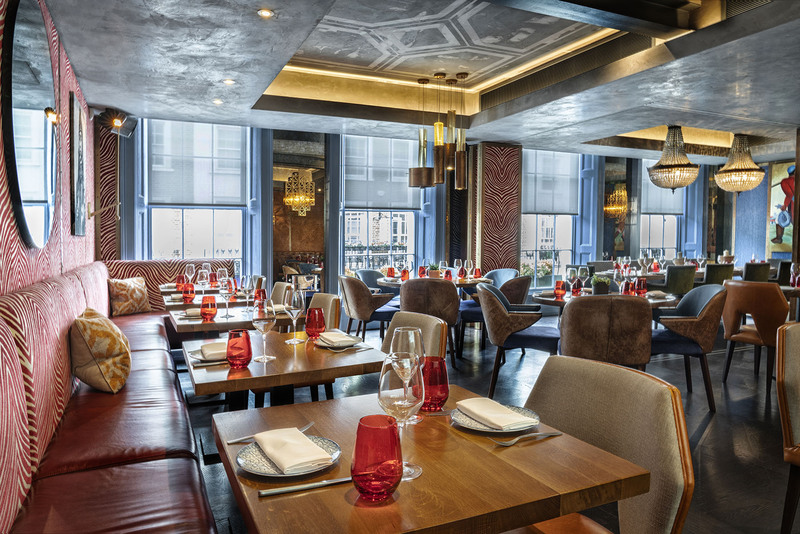 Small bites such as the Padrón peppers with feather light tempura chilli and ginger sauce cost from £5.50, while luxurious pescatarian bites of seabass sashimi with yuzu dressing and red caviar, or tuna tartare with aubergine hummus and black caviar are both priced £12. Fresh salads, such as the evocatively named ‘Adjapsandal’ with aubergine, peppers, chilli and Georgian spices, and ‘Shakarob’ with Uzbek tomato, Uzbek cucumber, and chilli make use of OSH’s fresh, organic market produce delivered “daily from the heart of Central Asia”. 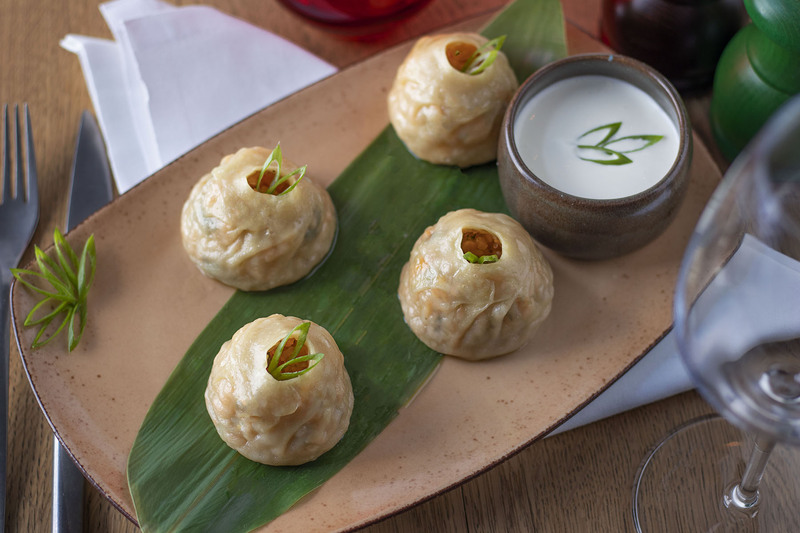 The hot dishes, prepared in sight at the kitchen grill, are the stars of the show. 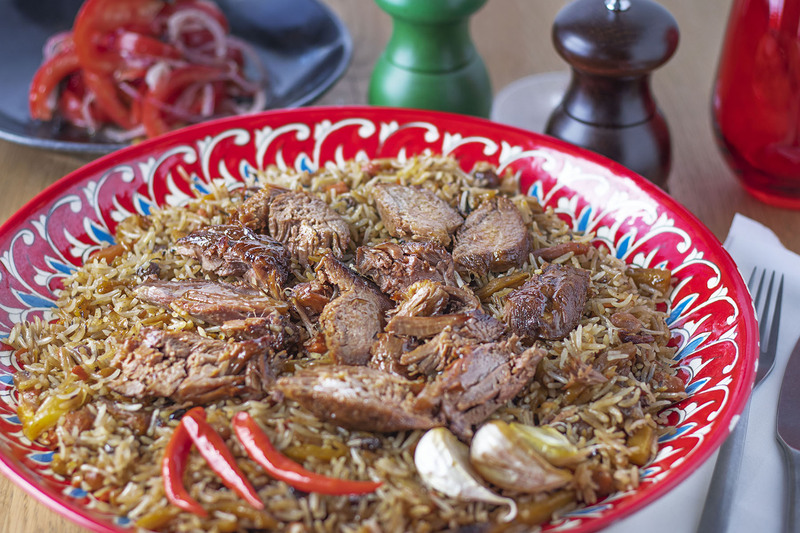 Uzbek osh, a signature slow-cooked lamb dish served with carrots, peppers, chickpeas and heaped onto pilau rice with a spicy ‘cha’ salad, is £16 for two people and a real highlight, as is the tender, herby and piquant beef fillet shashlik. 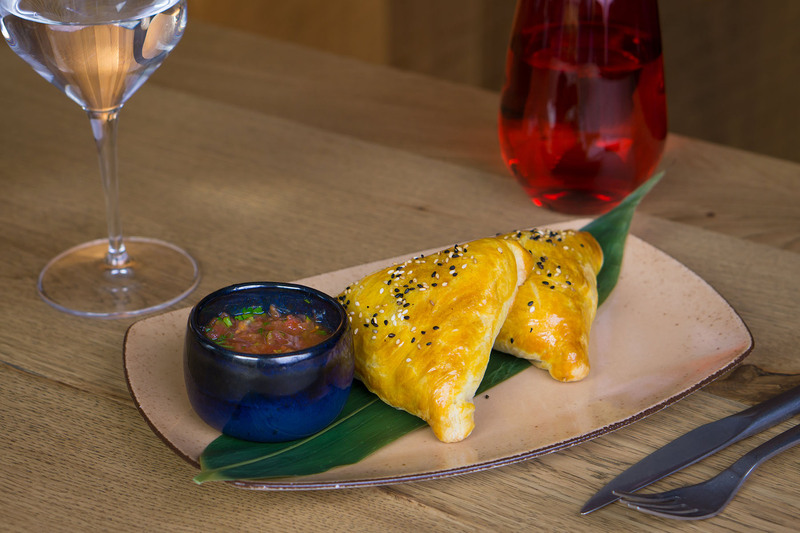 Heritage specialities such as lamb samsa – small baked pastries crammed with fragrant lamb mince – are reminiscent of a fine dining pasty, and its fried cousin the chebureki, are comforting and meaty. Simple flavours, beautifully presented. For those with a daily allergy, we were warned that most of the dishes had dairy in them (including the clay oven bread), so if you’re vegan it’s best to double check with the waiter. The experience was not without its faults. Considering the attention to detail with the interior design, placing the rather unsightly point of sale area right in the middle of the restaurant seems careless, and especially off-putting if you’re seated at the table jammed next to it (as we were). When one of the waiters accidentally knocked a heavy glass candle holder off the shelf, it landed on our table with some force, shattering into a cloud of glass shards. Staff were understandably apologetic, we were lucky not to have been cut by the glass, and were moved speedily to a different table. 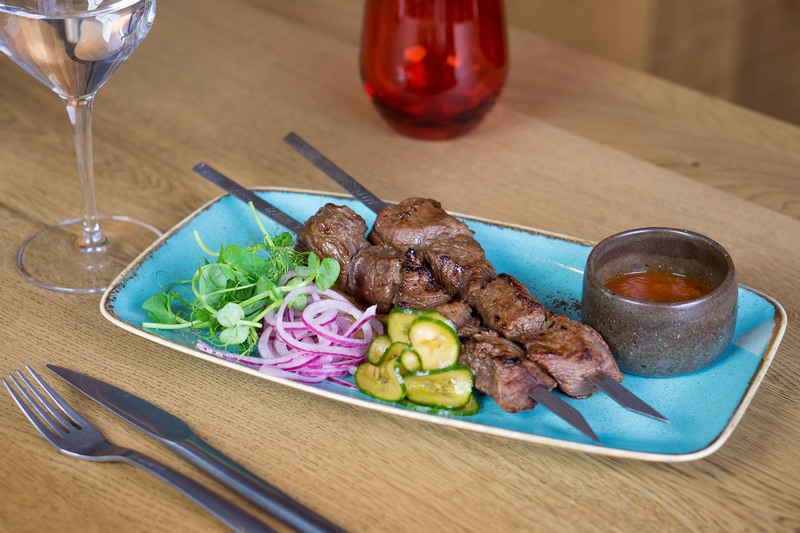 Mishaps aside, OSH certainly has the ‘wow’ factor, and is a lively new addition to the west London dining scene.